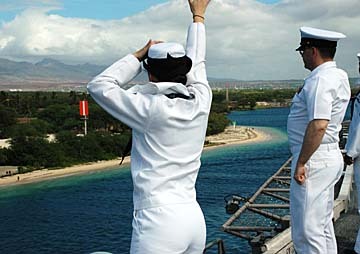 Petty Officer Paulina Centeno waved at beachgoers at Iroquois Point yesterday as the aircraft carrier USS Stennis sailed into Pearl Harbor for 36 hours of rest and recuperation. For nearly six months the aircraft carrier strike group USS John Stennis split its combat time between the North Arabian Sea and the Persian Gulf, hitting a record number of targets in Afghanistan and Iraq. Today the Stennis strike group, with its nearly 6,500 sailors and Marines, is completing 36 hours of rest and recuperation in Hawaii before leaving tomorrow on its final leg home to the West Coast, ending a nearly eight-month deployment. While here on leave, Petty Officer Jay Mamac, an air conditioning and refrigeration specialist, plans to visit his parents in Maili. This was his fifth deployment and his second one an aircraft carrier. He was a crew member of the carrier USS Constellation when the United States invaded Iraq in 2003. There wasn't much difference between the two combat deployments, said Mamac, a 1992 Campbell High School graduate. "Same job," said, Mamac, 33, "same business." Rear Adm. Kevin Quinn, who headed the Stennis strike group, said the carrier sailed directly to the Persian Gulf in March after leaving its home port in Bremerton, Wash., and then commuted through the Strait of Hormuz -- a major artery for global oil shipments -- to the North Arabian Sea at least 10 times. The Stennis spent half of its time in the North Arabian Sea 150 miles south of Pakistan, flying nearly six-hour missions into Afghanistan. From the Persian Gulf, fighters from the Stennis flew missions over Baghdad and southern Iraq. During the last 5 1/2 months in support of troops in Iraq and Afghanistan, F-18 Hornet jet fighters flew more than 7,900 sorties providing more than 22,000 flight-hours and dropped nearly 90,000 pounds of bombs. That amounted to 160 bombs dropped. "Our air wing set records for combat support in troops in Afghanistan," Quinn said. Capt. Sterling Gillian, commander of the Stennis air wing, said his 44 F-18 Hornet jet fighters were "kept very busy" trying to thwart the Taliban's spring offensive. The Stennis was part of the United States' three-carrier effort in the Middle East, which included the USS Eisenhower and the USS Nimitz. They were all part of the U.S. show of force in May when tensions were increased over Iran's nuclear ambitions. Capt. Brad Johanson, who was making his eighth trip to the Middle East as skipper of the Stennis, said the aircraft carrier strike group was able to move 350 miles through the narrow straits within 36 hours, demonstrating the U.S. ability to be flexible and to move that much "muscle" quickly. Two Pearl Harbor-based warships -- destroyers USS Paul Hamilton and USS O'Kane -- were part of the Stennis strike group's nearly eight-month deployment. However, Quinn said the Paul Hamilton did not join the carrier in the Persian Gulf and the North Arabian Sea. Instead, it sailed in the western Pacific working along the Korean peninsula and near Australia.